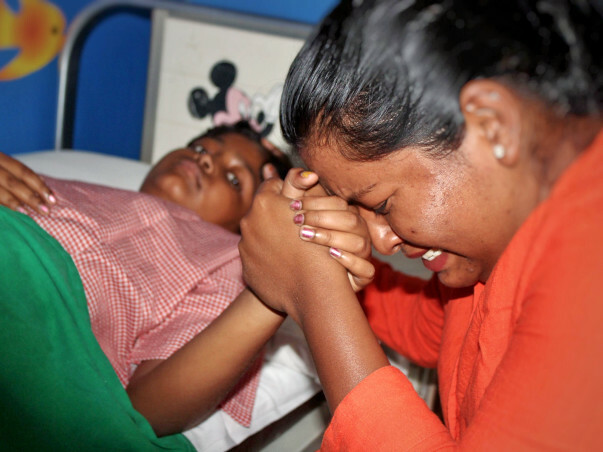 Harini walks into the hospital firmly holding her mother, Jennifer’s hand. When people there ask them how her cancer treatment is going, Harini looks at Jennifer puzzled. Jennifer quietly takes them aside and tells them that her 9-year-old daughter doesn’t know she has cancer and thinks she’s getting treated for a cough and wheezing. 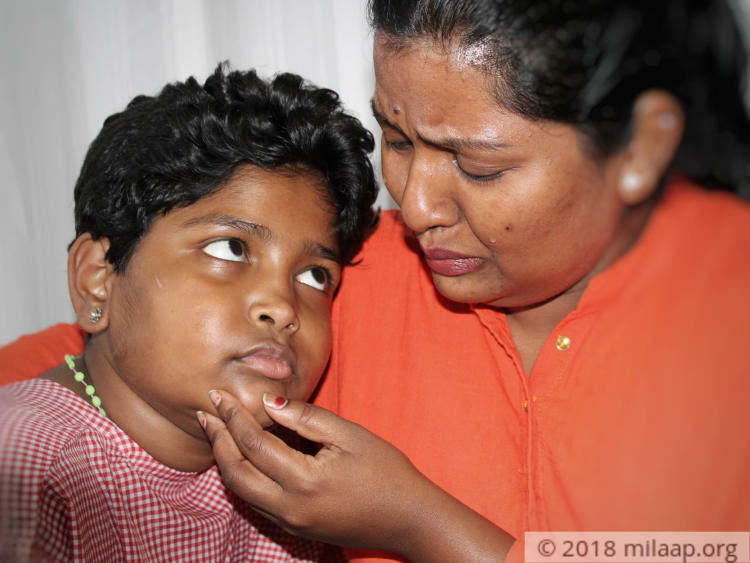 Little Harini is too young to understand the implications of blood cancer, but Jennifer cries herself to sleep every night at the thought of losing her only child to the dreadful disease. For 8 years now, Jennifer has brought up Harini with help from her sister and mother. When Harini was diagnosed with cancer last year in April, Jennifer couldn’t believe that fate had dealt such a cruel hand to her daughter who was already struggling with the absence of her father. However, Harini proved to be Jennifer’s strength. Harini has had chemotherapy for 4 days every week for the past one year now. However, her fight is long from being over. 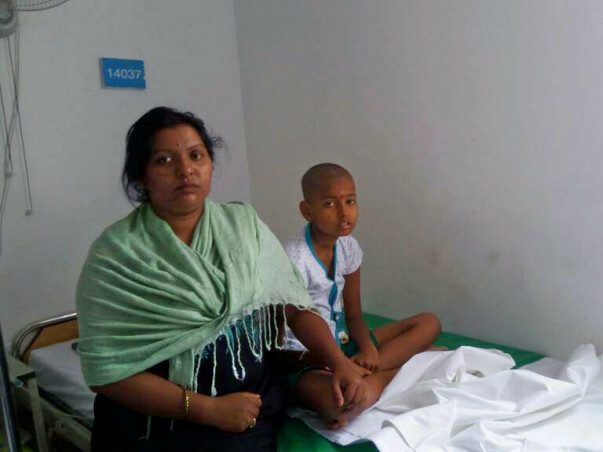 Harini needs to continue chemotherapy for the next 2 years to finally be free from the pain and misery of cancer. 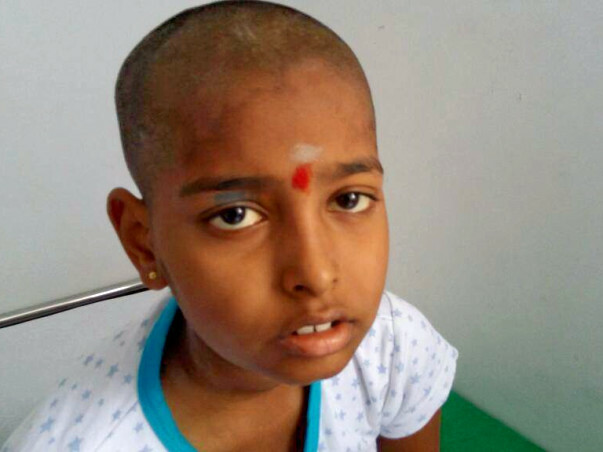 Harini now goes for checkups to the hospital every week and has chemotherapy once a month. Despite everything, she still insists on going to school. It’s her happy place, a place where she can finally be away from the disease that can take away her life at any moment without treatment. 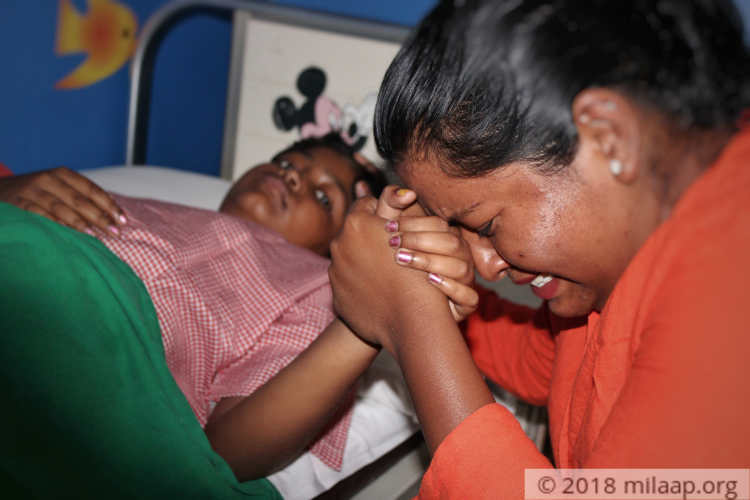 In the past one year, Jennifer has spent nearly 16 lakhs on treatment by borrowing from friends and family, but with no income and no financial aid from Harini’s father, she’s helpless. “My husband was a taxi driver, but he left us years ago. He visits Harini sometimes, but he hasn’t supported us with anything. Harini never asks for him, and we have now built a life of our own. She spends all day writing stories and poetry. When she notices that I’m a little sad, she runs to me and tells me about the stories she’s written. It’s her way of making sure I’m okay. She’s my biggest strength, my everything. All I pray is that she is saved from cancer. 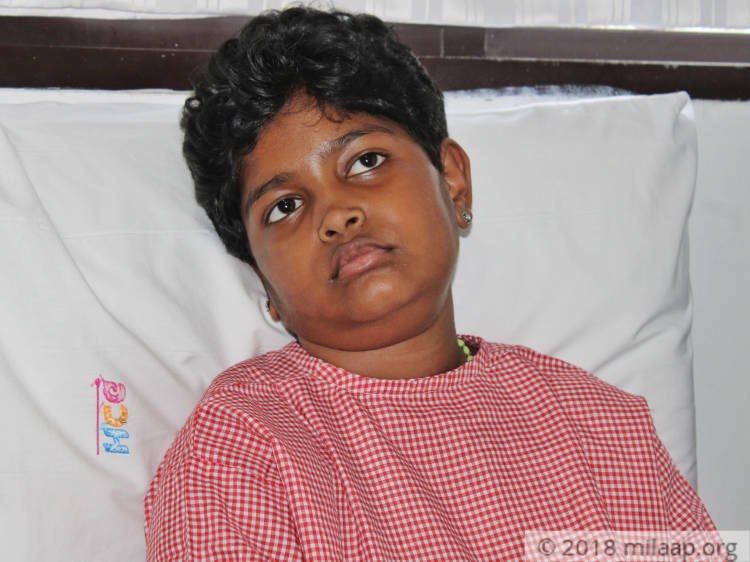 Harini needs continued chemotherapy to survive cancer. Jennifer, a single mother, can’t afford to give her only child the life-saving treatment despite her best efforts. 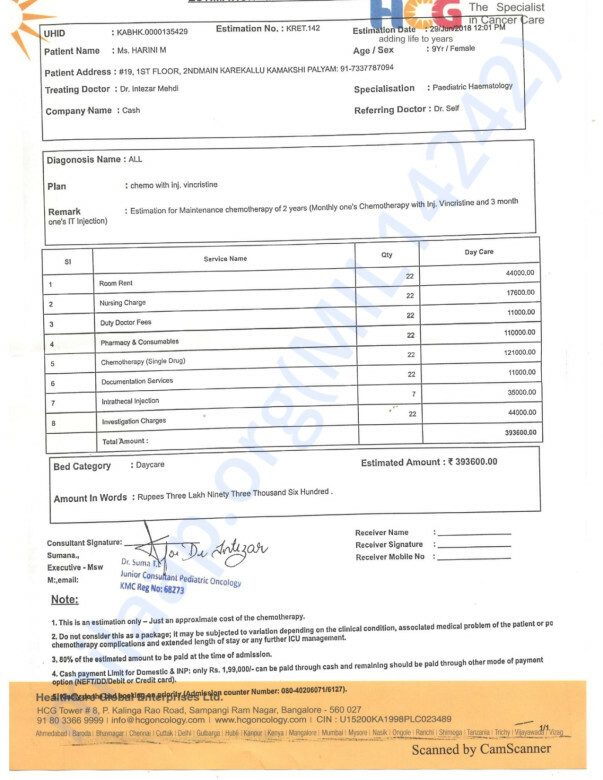 After spending lakhs on her treatment already, Jennifer is helpless. All Harini wants to do is wake up every day feeling strong and to see her mother smile again. 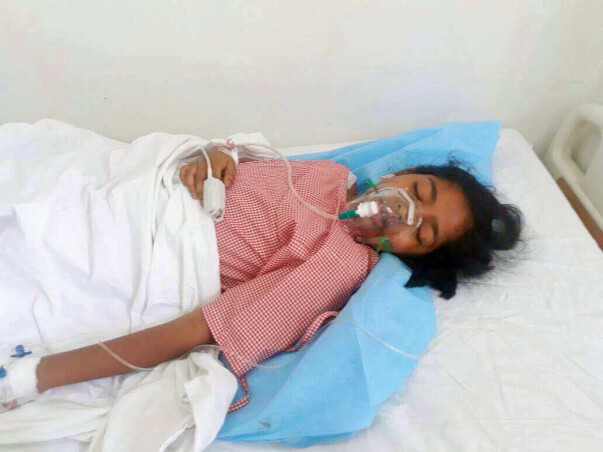 Harini can only beat cancer with your help. 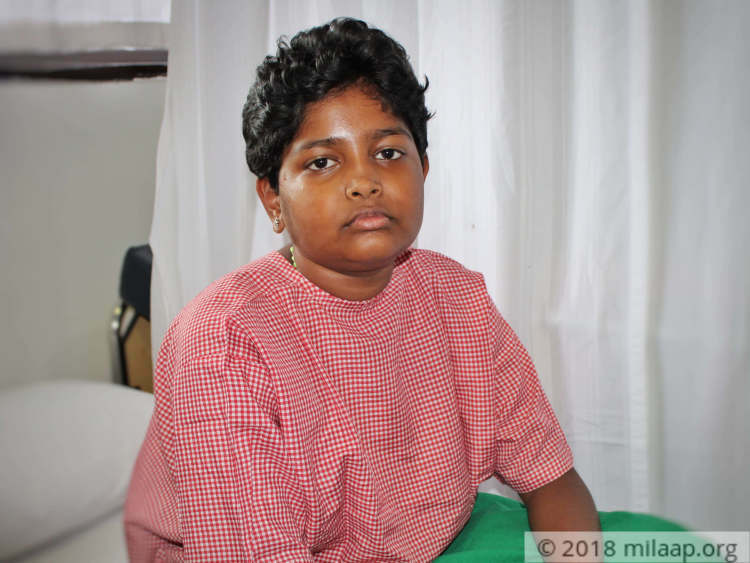 Your support will save Harini’s life. Harini is doing extremely well. She is visiting the doctor monthly and is undergoing blood tests, other investigations to see the progress. The doctor is happy with her condition and did not suggest any further treatment. She will be continuing the monthly investigations. Harini is still undergoing her maintenance chemotherapy. She has her went her recent chemotherapy recently along with few blood tests. Her condition is stable now. 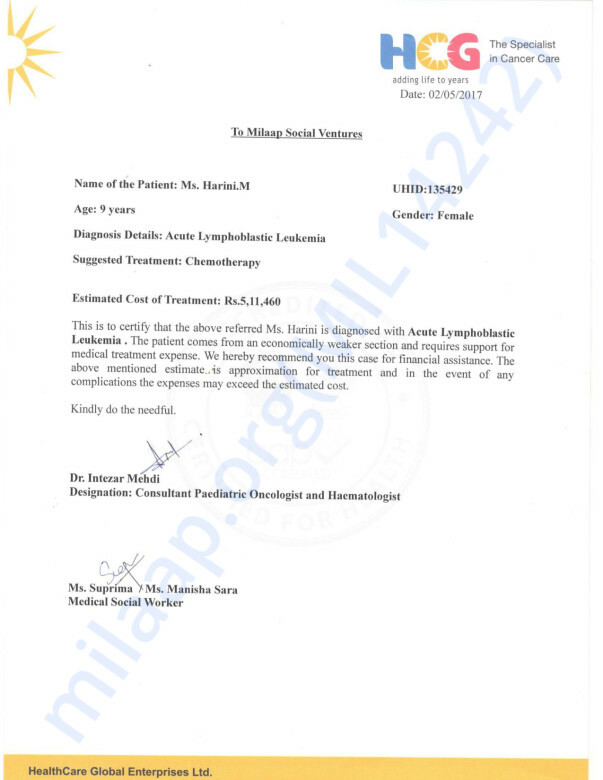 Depending on her reports, her further course of treatment will be decided. 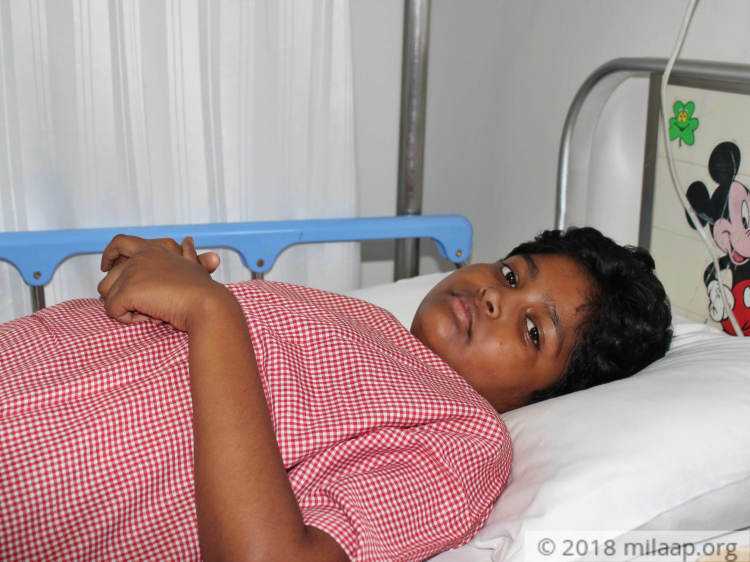 Harini is continuing with her maintenance chemotherapy and her health condition has been improved. She still has to continue with the regular follow up and few more maintenance chemotherapy's.